Robot Soccer (RS) vision system is designed for robot soccer competition. Most RS system implemented colour patches as main marker detector for robot localisation and ball detection. It requires complicated procedures for colour and camera calibration and highly affected by light to run smoothly while it suffers parallax issue. 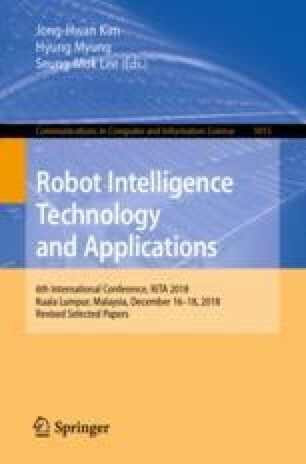 This paper aims to improvise the procedures and performance by minimising the calibration process for robot localisation and produces accurate marker detection for robot identification. ArUcoRSV utilises marker detection using ArUco patches to solve light limitation and able to perform camera calibration processes quick and reliable. It applies an automated perspective using marker detection, refining rejected marker and pose estimation. Experimental results for robot calibration and localisation using ArUcoRSV achieved significant improvements in detection rate with high positional accuracy. This system is expandable and robust to deal with various types of robots including low cost robots. The authors would like to Universiti Kebangsaan Malaysia, grant ID: KRA-2018-007 for the funding and support for this project.